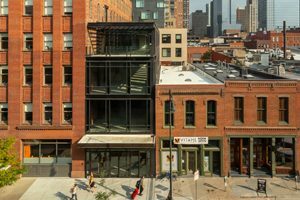 Description: SugarSquare, the 4-story building, located between 15th and 16th Streets on Wazee Street in Denver’s Lower Downtown (LoDo) neighborhood, stands as an inspiring example of innovative urban infill and technological achievement. Unlike any other project downtown, SugarSquare manages to achieve big design in an extremely narrow urban space – just 25 feet in width. Designed by architecture firm Semple Brown Design, SugarSquare was conceived as an addition to the historic Sugar Building at 1530 16th St. Description: Jordy Construction and Roth Sheppard teamed up to design and construct this new and impressive 14,000 square foot space to house the “new” Izakaya Den. The first step was to demo the existing building. From there, Jordy immediately moved to excavation, shoring and piers and then started construction of the new restaurant. Jordy was responsible for ensuring that features such as a retractable glass roof, banquet surrounds, 25-foot tall interior bamboo plants surrounding a glass elevator enclosure with a custom-fabricated stainless steel cab, 50-foot retractable roof system that opens diners on the second floor to Colorado’s beautiful outdoors, and custom first-floor perimeter Japanese millwork, were beautifully executed and incorporated into the space. 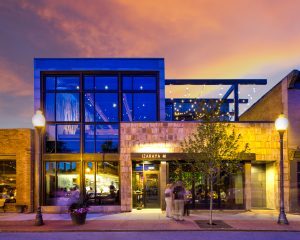 The result was a restaurant, the first of its kind in Colorado, from both an architectural and a dining point of view. Description: Jordy Construction along with Kung Architecture transformed a vacant, run down old school, into a vibrant community center for the Asian community. The project was a 8,133 SF, 2-story structure. It contained offices, an exam room and class rooms. It was a complete remodel of the space including new energy efficient windows, HVAC, ADA access and additional parking. It also included a 1,174 SF annex that is used as a community events center. Description: This project was an adaptive reuse of an existing 31,150 square foot usable commercial, warehouse/storage and cooler facility. Jordy’s award-winning contribution transformed Project Angel Heart’s building into a state-of-the-art commercial kitchen, distribution, and office facility to fulfill the organization’s mission to provide nutritious meals free-of-charge to those living with life-threatening illnesses.